Music Eduaction: Where are they now? Jeff Ball ’03, M.M. ’08, is the artistic director and founder of the Grand Street Community Band and the director of bands at a public high school in Brooklyn. Brian Diller, M.M. '12, is associate lecturer of music at the University of Wisconsin–Eau Claire, where he serves as interim director of the wind symphony. Sophia Miller ’06 is the assistant conductor (and sometimes serves as the conductor) of the Prelude Chorus. Rebecca Graham ’11 is the director of music at the New Roots Charter School in Ithaca. Casey Georgi ’11 recently volunteered at the Mzuzu Academy to teach music to underprivileged children in northern Malawi. Now, his experiences have brought him full circle. Daniel is the new band director at his former high school in St. Thomas—the very place where he first realized his passion for music and became inspired to study it in college. Daniel says that the experience he gained through student teaching, taking classes, and performing in the music school’s concert, symphonic, and steel bands helped him sharpen his skills as a musician and teacher. Daniel says he also developed a sense of confidence as a performer. During his senior year, he took on the E-flat clarinet—an instrument he had never played before—in the symphonic band. He says that he was nervous about playing a solo during one of the band’s performances, especially on an instrument that was so new to him. But when the time came, he stood up and played the part perfectly. 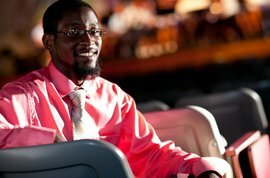 The challenging music education curriculum wasn’t the only thing that prepared Daniel to take on a teaching position after graduation: Being more than 1,500 miles away from home was difficult for him at first. But he learned to adapt to life away from his friends and family—and brave Ithaca’s cold winter weather. Daniel’s hard work and perseverance paid off when, in the fall of his senior year, one of his former music teachers told him that the band director position at Charlotte Amalie High School was available and recommended he apply for it. After several interviews, Daniel got the job. In order to start on time, though, he had to finish his degree—and fast. The position was set to begin before Daniel graduated from IC. So he and his professors worked together to create a schedule that would allow him to finish his degree early and be ready to start his new job. By the time graduation came in May, Daniel had just one last requirement to finish: his senior-level student teaching course. With help from his pedagogy professor, Penelope Woodward, he taught music to students at a local high school in Trumansburg and finished his degree in June in time to return to his family—and his dream job waiting for him—in St. Thomas. Daniel plans to one day earn a master’s degree. For now though, he hopes to inspire students with music—much like he was motivated to perform and learn more in high school.